The last few days have been full of germs, laughing, crying, good food, good friends and a couple good runs. 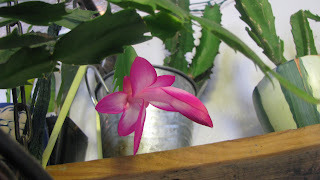 My late Christmas cactus ,or early easter cactus which ever it turns out to be, is blooming and not one of the little monsters has pulled the blooms off! The kids have all had a fever followed by a nasty cough. Mild sort of bug comparatively but its hanging on longer than my sleep deprived self would like. I just can't seem to sleep when they are coughing. Its the whole mother thing. meh. Goes with the job. We are all getting better very slowly. On Sunday I got in a 10 mile barefoot treadmill run. 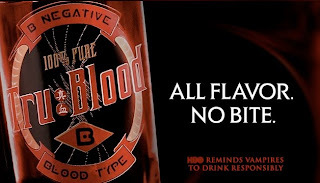 A friend sent me the second season of TrueBlood and I got in almost 2 episodes and felt loads better after a 4 day rest back to health break. Not running was taking its toll on my psyche as much as the bug was on my immune system. I think my feet, my right foot to be exact, are getting used to the treadmill and I am not having blister problems anymore. I have a sore right knee and ankle while running and I am stretching to take care of that. I am also still one week ahead on my goal to run 1000 miles in 2010. Monday I only got in a 3 mile barefoot treadmill run but I walked for a mile after and watched some more TB. Its fun to get my vamp on since its a bit to scary to watch with the little ones running around although I do get kinda creeped out all alone in the basement with a sneaky dear one who likes to booo us when we are not expecting it. Mondays are full of therapy and school for Jupiter, both of which I go with him to and by Tuesday I had had my fill of autism and therapies and lack of progress. I enjoyed seeing my friends and it makes Tuesdays bitter sweet. I decided to ditch school with Jupiter that afternoon. He was clearly not wanting to go and do, once again, the same old boring stuff that is obviously not working. We went grocery shopping instead. Everyone has fun going shopping and we did have a nice time. The boys ran around and did lots of helping and we spent loads of time looking at toys and electronics! Jupiter was much calmer and seemed happy. Yesterday evening I met my friend Patty at the West Des Moines library for an Autism Society meeting that turns out is next tuesday! We sat and talked for a few minutes. She brought me a gluten free recipe book she has compiled and another batch of wonderful soup. She makes the best soup! This was a bison meatball soup with potatoes and carrots and spices. Its exactly what I needed since the cold I was fighting off was taking its toll. She also included the recipe for the soup in the book she gave me! When I got home I ate the whole thing! Well almost all, Archimedes mooched a few bites. Jaymon and I did about an hours worth of Yoga. It was lovely! I pushed hard on the poses I most need to work on and I made friends with the pain. I was rewarded with the warm fuzzy feelings when we were done. Here is a photo of the camel pose. It opens up the hipflexors. Tight hip flexors are a source of lower back pain and possibly part of my knee discomfort as well. After Jaymon mentioned it, I am now thinking it came about during pregnancy. The way your back sways and your posture changes to accommodate the belly it would make sense that the hip flexors would have tightened up. It is a goal of mine to lengthen and stretch my hip flexors. I think it will make me a better runner and stave off that nagging lower back pain. 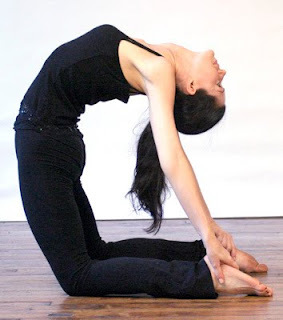 I also do the cobra pose and am someday going to be able to do the Wheel pose like I did when I was a youngen. I did some handstands to work on my wrist strength as well as the crow to help with doing the wheel which I found to be very uncomfortable in my wrists and shoulders. To the right is my blogger friend Averie over at Love Veggies and Yoga. Someday I want to be able to stretch like that! She also reviews supplements of which many are ones that I too have taken or the whole foods are ones that we eat in our family as well. She inspired me to not leave out things like the below discoveries. 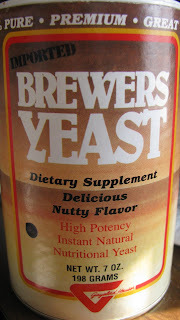 I have been meaning to blog about Nutritional Yeast or Brewers Yeast. Its a deactivated (its not live yeast that you would use for baking bread) yeast that has a mild nutty flavor and is jam packed full of nutrients. I found it on Gluten Free Goddess's website that she uses as a main ingredient for an uncheesy cheese sauce for gluten and Casein free folks. The Uncheesy cheese sauce is quite good but with all GF/CF cooking, one must not compare to dairy or wheat recipes but try to appreciate the new flavors on their own. That said I spiced my cheese sauce up and really like it for dipping corn chips in or putting on broccoli and cauliflower. I also like it on my salads with spicy beans and chick peas. 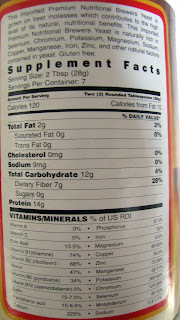 Here is one side of the container stating some of the nutritional value. It has to have two different lists to accommodate the amount of good stuff in this super food! This is an excerpt from Wikipedia on yeast. "Yeast is used in nutritional supplements popular with vegans and the health conscious, where it is often referred to as "nutritional yeast". It is a deactivated yeast, usually Saccharomyces cerevisiae. It is an excellent source of protein and vitamins, especially theB-complex vitamins, whose functions are related to metabolism as well as other minerals and cofactors required for growth. It is also naturally low in fat and sodium. Some brands of nutritional yeast, though not all, are fortified with vitamin B12, which is produced separately from bacteria. Nutritional yeast, though it has a similar appearance to brewer's yeast, is very different and has a very different taste. Nutritional yeast has a nutty, cheesy, creamy flavor which makes it popular as an ingredient in cheese substitutes. It is often used by vegans in place of Parmesan cheese. Another popular use is as a topping for popcorn. It can also be used in mashed and fried potatoes, as well as putting it into scrambled eggs. It comes in the form of flakes, or as a yellow powder similar in texture to cornmeal, and can be found in the bulk aisle of most natural food stores. In Australia it is sometimes sold as "savory yeast flakes". Though "nutritional yeast" usually refers to commercial products, inadequately fed prisoners have used "home-grown" yeast to prevent vitamin deficiency." I have been eating Brewers yeast sprinkled, ok poured, on my popcorn and a couple tablespoons added to my bowls of soup. I put it on pasta for the kiddos as well. Between this an my Kombucha, I think I am getting caught back up on nutrients I must have been missing since I have been craving it so. I used to get leg cramps during pregnancy and I discovered a suppliment called Natural Calm. It is a Magnesium Citrate powder that mixes very well in liquid. I get the raspberry lemon flavor and just mix it with water. It is a tad sour but tasty. I take it mainly at night before bed and it helps me feel sleepy and relaxed. 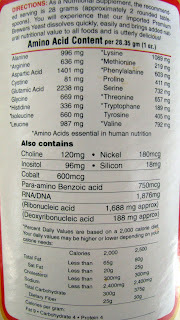 Here is a link to the website with its nutritional information. I eat a banana or some prunes with it to get some potassium after running. Its best to take magnesium and potassium together and separate your calcium and Vit D supplements by a few hours or more for best absorption. The link above goes over the benefits of magnesium as well as the symptoms of a deficiency. There are other brands out there but the best form magnesium to take is citrate as its more readily absorbed. I have others to share and someday soon I will compile a Kombucha post and its wonderful properties as well as Kefir. As for running. I am taking today off since I don't really feel like running so I am taking that as my body saying it needs some rest. Tonight I will hit the yoga again and then tomorrow do a 10 mile run or more. I need to challenge myself to do 18 miles but I don't think I will be completely back to health to do that much yet. Hopefully I can start outside since it will be a balmy 34 degrees!! I feel like a wuss not going out in the "very cold" which to me is anything below freezing, since I have runner friends who do so often and sometimes barefoot, but I am really not a fan of the cold and thats why my treadmill is so wonderful, of which I still have not named! Tomorrow though may be one of those fleeting days when I can venture out for even a few miles and then finish off on the treadmill since we have a doctors appointment in the afternoon and I might be short on daylight. "Quit... don't quit. Noodles... don't noodles. You are too concerned with what was and with what will be. Yesterday is history, tomorrow is a mystery, but today is a gift. That is why it is called the present." Hmmm, I may have to get me some calm - ot won't get me pregnant will it? That would be some crazy stuff if it did Jamoosh. It will help regulate your calcium absorption though. Thanks for becoming a follower! Your blog is super cute. Hope the little ones are feeling better! Pretty cactus! Enjoy it while it lasts! Hope everyone is better soon! And thank you sooo much for the lovely shout out. And there's the pic of me...wow. Crazy seeing myself on someone else's blog LOL but thank you, I am flattered! Averie, I just looked at the 2nd website and it said that Brewers yeast that is used for a suppliment is deactivated and is much like Nutritional yeast as its from the same strain although Brewers is a by product of beer making and has a bitter flavor. Nutritional Yeast is from the same strain but grown from molasses. The kind I posted was grown on molasses so I think it is Nutritional Yeast but has the name Imported Brewers Yeast. Thank you for pointing it out to me though. I had wondered how it could be gluten free if it was used in brewing. I am still not really sure now if the terms are used too loosely in the marketing of products. hey girl i almost never come back and check comments but i wanted to pop back. I have no idea if they really are or arent the same; i thought they were different but honestly too tired and too indifferent to google it. but i need to research it on my own for a rainy day, ya know when i have time for daytime soaps and bon-bons on the couch with my maid massaging my feet. LOL a mom can dream, right?! happy nite sweetie! "Katie, Nutritional yeast is a non-active yeast that has a nutty/cheesy taste. It’s also high in B-vitamins, and so it’s great to use in “cheeze” sauces if you’re vegan. I’m not vegan, but I love using it in place of Parm and in various sauces. I buy mine in the bulk section at Whole Foods, and they also sell it in canisters in the supplement section. Just make sure you buy nutritional yeast and NOT Brewer’s yeast. 2 different things." The thing Averie is that the brand I have is Nutritional yeast that has the name International Import Brewers Yeast. It even says its nutritional yeast on the can. It has a nutty cheesy flavor and not bitter at all like the vegemite or marmite. So we are all right in thinking that there is a difference and I think its a huge difference. I think this particular brand is just screwy with its name. I think it is Nutritional yeast but they chose a poor and confusing name. Its also grown on molasses which was one of the defining factors for Nutritional yeast. I should post about it all :) Its been bugging me too. I looked on several sites and read the ingredients and descriptions of their yeast products and can clearly see the difference.